There is a requirement that most of us faced specially when implementing SAP for Food & Beverage which is excluding expired batches from the MRP run calculation. I found the following solution as one of the proper ones to be applied. I assumed that Batch Management with shelf life date is already activated and other posts may explain how to implement it. There is a mass processing procedure to restrict batches through the recurring Inspection cycle but the following one is useful if you did not apply this scenario in you system. 1- Exclude restricted batches from the net calculation in MRP. 3- Make the following Configurations for Batch Tractability Cockpit as restricting Batches will be done through the cockpit. 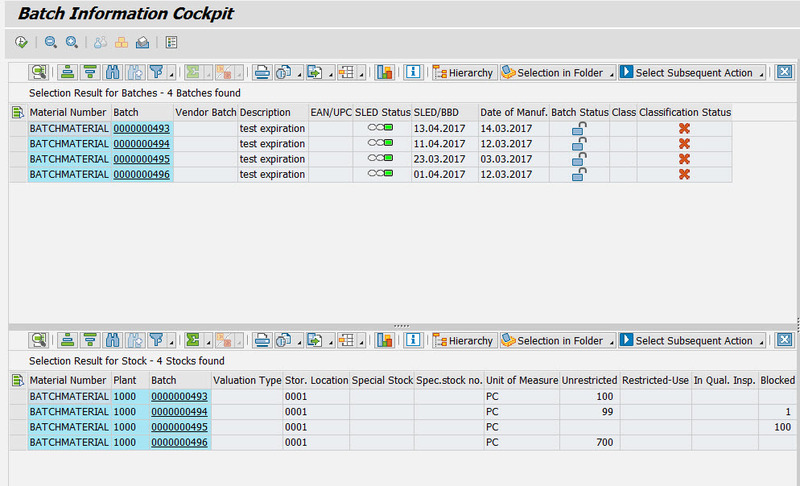 In this step, you can adjust the selection in the Batch Information Cockpit to meet your needs by defining one or more user-group-specific selections. You can copy the standard one if it is enough for your purposes. I preferred to make the user group that I made to be the standard one (this is optional). Maximum Number defines the maximum number of batches to be shown according to the selection criteria, I made it 999999 to show the maximum number, if you leave it blank the default number of hits is 50 batches. Also simulate User group shows the selection tab and fields how the will look like. You can compare them also by the SAP Standard view. You can access the SAP Standard View by T-code: OBIC_DIS (It helps a lot). 2. Assign Follow-up Actions to the created User group. This step is to show the restricting and unrestricting actions in the cockpit screen. 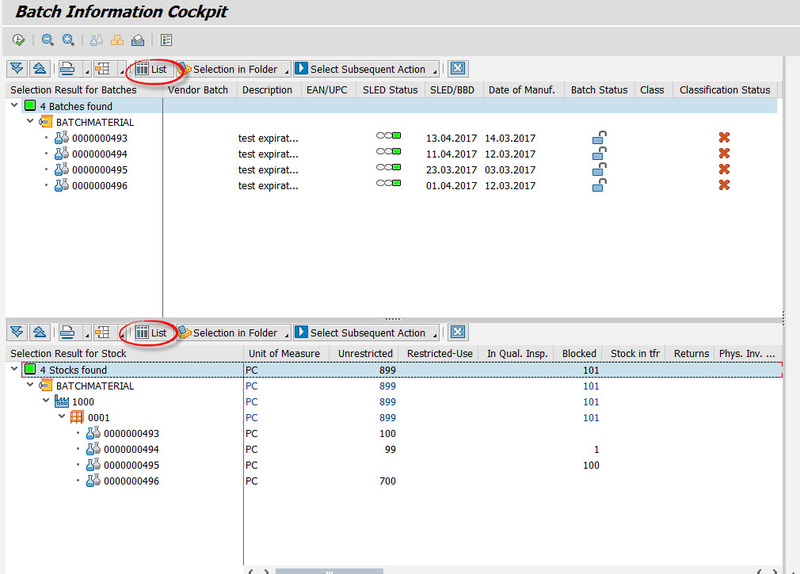 Assign the follow-up actions SAP1 and SAP2 to the created User Group. I created a material as a raw material (Batch Material) and included it in a BOM of a finished Product, also I applied the shelf life for this material. Using BMBC (batch Traceability cockpit) I searched for the available batches with Remaining Shelf Life. After execution the following batches appeared. You can view them from the batch view or the downside Stock view using the stock yellow button. I clicked on List button to make batches easier to be selected. Now let’s have a look on the Stock Requirement list before restricting the batches. It shows that there are 899 PC’s are available in stock and a planned order is made by the net requirement. Restrict the batches inside the batch cockpit. Select the desired batches to be restricted and choose follow-up function restrict. The restriction is done through movement type 344. You can reverse this process by choosing Unrestricted instead. Now let’s have a look again at the stock requirement list.